After you have created all the deformation chains for your character, you will need to assemble these separate body parts into a puppet. Your pieces should be properly overlapping and not set apart. To avoid problems such as having the head stretched by the neck deformers or a hand modified by the body deformers, you can use the Kinematic Output node to assemble your pieces without propagating the deformations down the hierarchy chains. 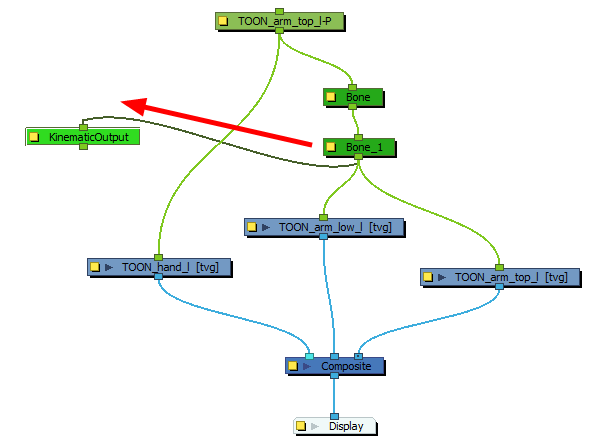 When building a cut-out puppet with deformations, each part controlled by a deformation chain will automatically rotate from the chain root point, which acts like a pivot. 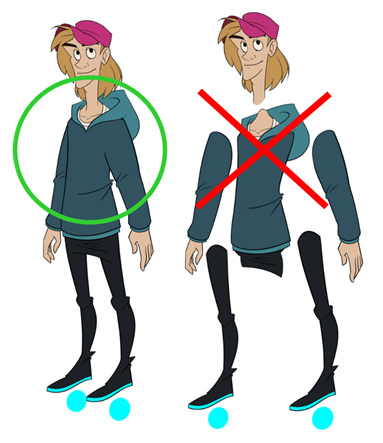 Because it is unlikely that every piece of your character will be rigged with a deformation chain, you must set pivot points for the pieces that are not using deformations—see Setting the Pivots. You cannot parent deformers directly because deformers are not designed to be used on other deformers. To assemble deformers, you must insert a Kinematic Output node. Your peg must be placed above the deformer. If your pieces are no longer ordered properly, use the Z-nudging feature to reorder them—see Nudging Parts Backwards and Forwards. 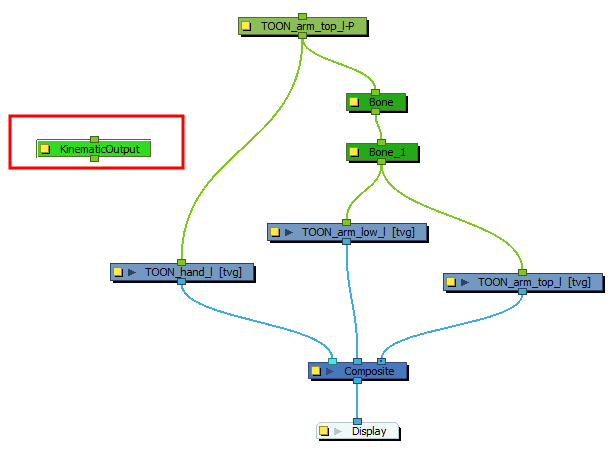 In the Node Library view, go to the Deformation section, select the Kinematic Output node and drag it to the Node view. Pull out a second output connection (bottom port) from the deformer node you want your piece or limb to follow and connect it to the Kinematic Output port. Connect the Kinematic Output node to the piece you want to follow the deformer. 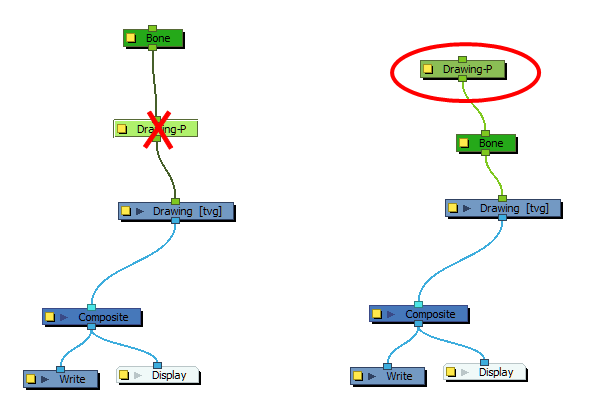 ‣ If it a good practice to rename the Kinematic Output node to reflect which deformer it is assigned to as the node structure can become very large and nodes can be positioned far apart. 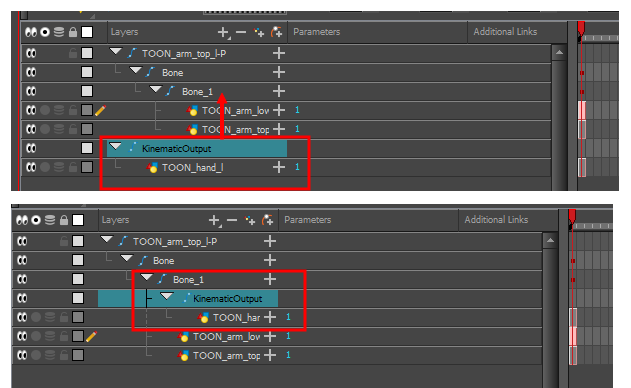 Select the Kinematic Output node and in the Layer Properties view, rename the node. 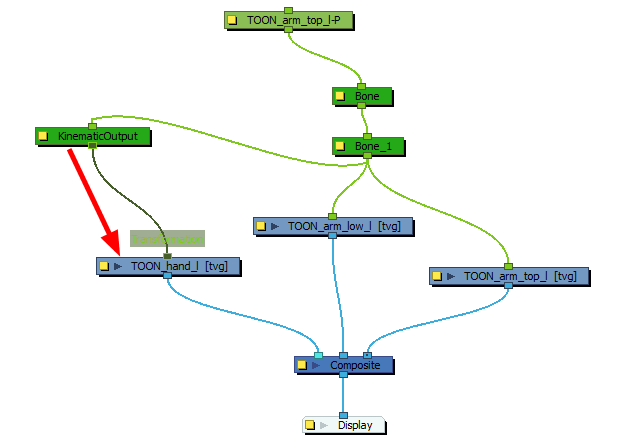 ‣ You can pull out multiple connections from the same Kinematic Output node if many limbs and pieces must follow a single deformer. For example, you can use the same Kinematic Output node for both arms and the neck to follow the body deformer.